Well, that's January done then, 31 days whooshed by in the blink of an eye. Wish I'd stay on that diet 29 days ago, but that's wodka under the bridge now. What's done is done. Have a chocolate kiss. We can't dwell on any kind of negativity while there are lovelorn frogs in the world! Do you see how he is looking at you? How about now? Can you see how he is still looking at you? His eyes are following you around the room because he woves you. Not woves you like a blanket, wuves you like a puppy. He is, of course, a colored and winked Purple Onion frog, sitting on a PTI oval, and encased in an MFT stitched heart. He wanted the heart cut from the pretty green paper because it looks so good with his skin color. His swoon was made, letter-by-letter, using Concord & 9th's Sophisticated Script, which I'm an idiot for not using more often. 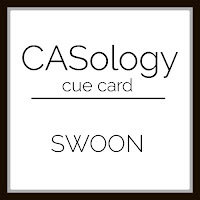 My Froggie all aswoon was created especially because CASology has such a fun and perfect cue card: SWOON! I used the sketch from Freshly Made Sketches. I didn't use a rectangle, but I think that's okay. And I'm entering CAS on Friday: Color Me Pretty. As always, thank you for coming by to visit the Playhouse and a special thanks to you if you take the time to join as a follower! Please let me know you came by so I can be sure to return the favor! Wait. What? One card? Is Hammy okay? Yes, he's fine! He's letting me slow down a little while I patiently wait for new glasses, but I can see his little wheel spinning feverishly as he thinks up lots of future ideas! So cute and beautiful. Love it! He is an absolutely gorgeous froggie! Hi Darnell, You just reminded me to change the calendar page. Such a cute card Darnell, I love the frog. Yep and those eyes are still looking at me even when I turns me IPad upside down and wadra mean I gotta wait 10 days to find out the next twofer challenge!! Haha! What a fun and woving frog, Darnell. Thanks so much for sharing your delightful card and humorous description! I wuve the froggie and his bright eyes even though they are following me. He looks so cute in his pretty green heart. Oh my gosh, you did make me laugh when I read about how old I am!! Good thing I didn't have coffee in my mouth. Just think, if you tint your new lenses pink, you can look at the world through rose colored glasses every single day. Hero Arts.........Hello Tree and Friends. It's on Pinterest but I don't have Pinterest. I looked it up on Google by typing in Hi Hello Hugs Tree Stamp. Yay! I won! What did I win? Nothing? Well......you could send Hammy for a play date with Woolfie. 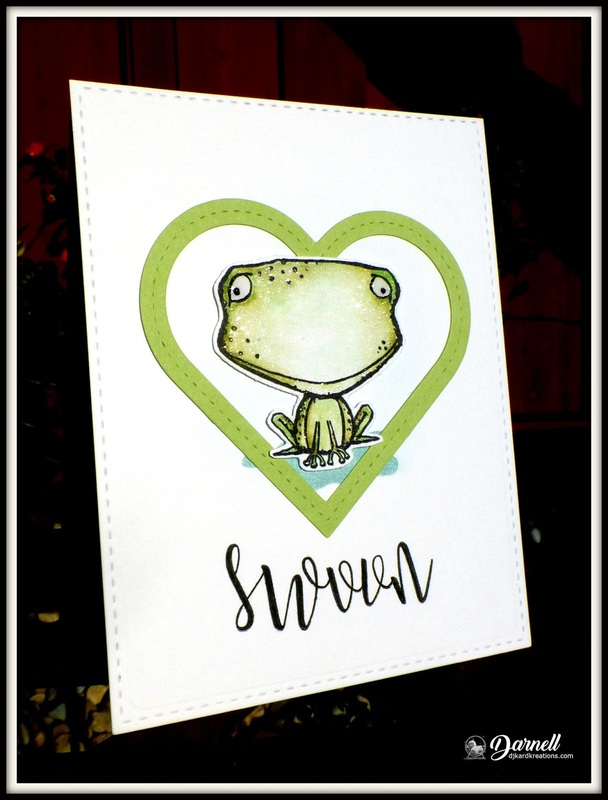 Cute frog card. Miss Piggy would love him, too. Plus all of girls that kissed the frog and got our prince love him. Well that is just adorbs I love cute frogs. He could just follow me home anytime. Love this sweet fellow! The heart is just perfect for the sketch...adorable take on the challenge. Always glad to see you at FMS! only you could get wobbly eyed over a frog. LOL. But seriously he is gorgeous and so cute. Love everything about this card and your super design. He could definitely win a staring comp. LOL. Diet goodness I'm running for the hills as I should really be on one but I think I have given it the heave ho for now, but watch this space as they say. Love and big crafty hugs from my house to yours. Jenny L.
You've used my favorite frog, EVER! Never noticed how his eyes follow one nomo matteer the angle, though. Not sure I like it...kind of disconcering, isn't it? But still he looks so adorable on your card, I smell another winner. What a fun card, so cute. Now that is just about the cutest frog out there. Love the heart perfect for the month of February. Wondering where January went! What an adorable froggie! I love how he is inside a green heart frame too. And, yes, I can see how he is eyeing everyone who looks his way too. So cute! What a fun little guy to have swooning over me! Love the green heart that is so perfect to frame him! My diet has consisted of more chocolate kisses than diet food. Maybe that's why I'm not losing weight! What an adorable little critter! Love this cute card...and I need to use those letters a little more often too! LOL! Fabulous froggy Darnell, and I love that you created your own sentiment. 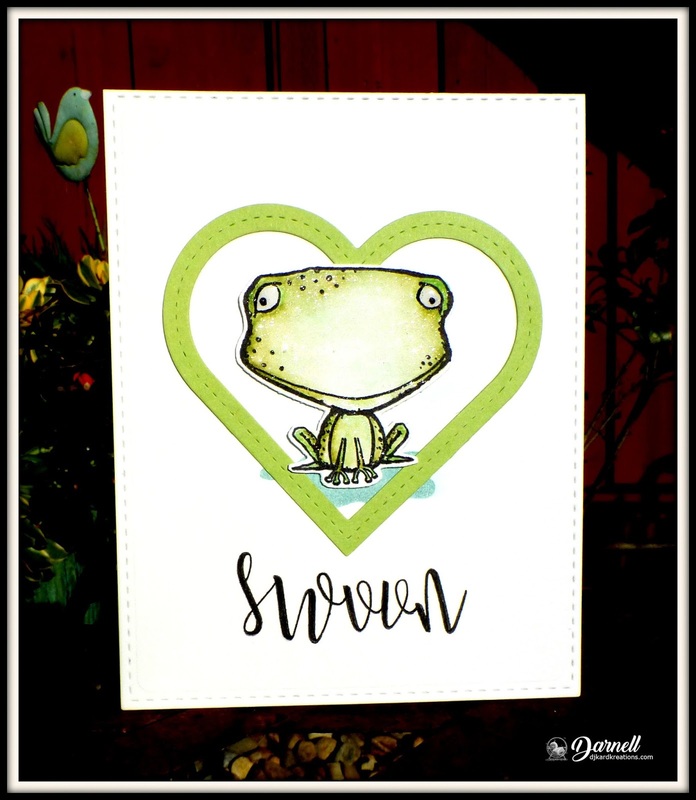 so cute, everyone loves a green frog and a great sentiment. I have that letter set but never think to use them. Don't think I've ever been wuved by a frog and such an adorable one too! Adore your sweet card and sentiment! Yeah, that frog definitely looks lovestruck. Poor thing. Hope he finds his true love before Feb. 14. That is such a funny image & how clever to use him with the heart, Darnell! Such a great card. I have always thought he was a very cute frog. Love the way you had the patience to stamp each letter to make your own sentiment. Fantastic idea inspired by the word. I like the funny guy and his eyes. Your colouring is fabulous. What a little cutie, Darnell. The heart frame highlights him perfectly. I wuve him! Your little frog is so cute and looks perfect on the card. He's sure got me swooning after him! I love frogs and used to collect their ceramic kind years ago, until so many pairs of eyes looking down at me from the shelf gave me an inferiority complex while freaking me out! Yup this cute frog does wuve! I love the coloring. The little green heart adds a nice touch to the design. The sentiment looks amazing in that font. Thank you for joining us at CASology Challenge this week. Thanks for joining us at Cas on Friday! Aww, I wove him, too! What a darling Valentine he makes, sitting there all sparkly in his skin-matched heart frame. He makes ME swoon! Love those letters. Yes, you should use them more... big talk from a person who has a basket full of NBUS, right? I do have a feeling I'm being watched. Can you see me though his eyes? Adorable! And the coloring is awesome! Thanks for joining us at CASology! Oh, he is so sweet and beautifully colored, too! Hilarious! Great frog...and great card. That cutie can follow me anywhere, Darnell. I have some letters like that and never think to use them either. Thanks for the reminder. Darnell, How cute! Think I'm in love with this little swooner. Ooo how cute froggy and his look... Are you shure that hi isn't a price :-)? How cute, what a great design idea! Ha! This frog is just the cutest! Adorable card, Darnell. So happy to see you at FMS. Hey Darnell!!! I love your froggie!! He is so cute. Great coloring! Thank you for playing along with CASology this week. Frogs aren't my thing, but this one is cute and fun! I come to this place every now and then. The place is really nice, the crowd is full of regulars, and the food and drink specials are pretty good! The staff at San Francisco venues is great and really gets to know your name. Totally worth your time on any night for good food and drink.